Announcement: WE HAVE A PODCAST! The Deplorable Housewives of the Midwest can now be heard on Anchor.fm, Stitcher and Pocketcasts! 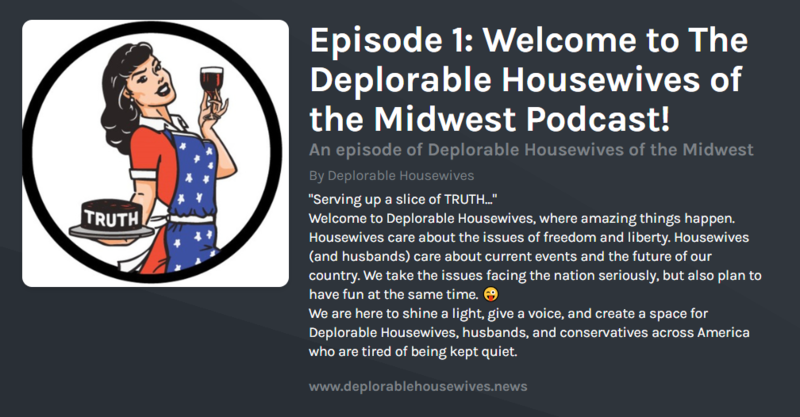 The Deplorable Housewives of the Midwest are branching out into the podcast world with a brand new talk show published on Anchor.fm; soon to be added to all the major sites like iTunes and Soundcloud. Listeners with the Anchor.fm app (its FREE! ), can not only listen to the Housewives discuss current events and issues, but they can also utilize the “comment” tool and leave a audio comment on the show. Let us know what you think and we might include your comment in the next episode. In the inaugural episode, the Housewives discuss a myriad of topics including the latest from The Hill’s John Solomon about the Clinton bought and paid for “Trump Dossier” – How the DOJ warned it “might be biased”; Laura Loomer’s adventure at the “All are not welcome here” home of House Speaker Nancy Pelosi and a variety of other topics. Please check out the program and share it with your friends!